Convert DRM-ed Apple Music to MP3, WAV, FLAC & M4A. Remove DRM from M4A/M4B/AA/AAX audiobooks. Convert both DRM-ed and DRM-free audio to MP3/FLAC/M4A/M4B/WAV. Support Catalan, Portuguese, Slovenian, Vietnamese and Persian. Support to convert undownloaded Apple Music files. Fix the bug of failing to get some special characters of Western European languages. Optimize the process of reading iTunes library. Fix the launch failure issue in some circumstances. Fix the conversion failure issue with the Windows 10 Store version of iTunes. Fully support the Windows store version of iTunes. Support converting Audible audiobook to specified format. Support right clicking to copy and paste license code in register window. Fix the certain issue that the history list is empty after converting successfully. Fix the issue that the iTunes Library is too large to load. Support Czech, Filipino, Korean, Norwegian, Russian, Slovak, Swedish language, and update Japanese language package. Fix the problem that the output folder with "." is unable to open. Fix the conversion failure issue for some audiobooks. Change the naming rule of output file to "TrackNum+Title". Fix the load failure issue of iTunes library in some circumstance. Add function "Hide iCloud Files" in the adding window. Fix the conversion failure issue in some circumstance. Optimize the recognization result of iTunes Library. Show iCloud files in the Add window and add the prompt to download them. Support to convert protected M4B audiobook from iTunes Store. Update Italian, Turkish, Lithuanian language files and support Greek. Fix the crash problem when click the Add button in some circumstance. Improve the response time of loading large iTunes library. Fix the issue that the registration code became invalid after several conversions. Add the pop-up window to remind users not to use iTunes while converting. Fix the conversion failure issue on Windows 10 system. Change to a brand-new interface. Fix the crash problem in some circumstance. Support to drag m4p, aa, aax file from iTunes to program to convert. Fix the crash issue due to the file name being too long. Add output to FLAC lossless format. Fix the bug that the program fails to detect some music. Fix the no responding issue when adding music to the program in some circumstance. Fix the crash problem when clicking Add button in some circumstance. Optimize the operation of deleting converted files under history panel. Fix the failure of launching iTunes caused by installing our program to a folder with non-English characters in its name. Support converting to WAV format. Add settings to adjust conversion speed, up to 10x. Organize the output folder displayed as Artist / Album. Fix the occasional crash problem after batch conversion. Improve the output audio quality. Retain Track Number and art cover of the song after converted. Support for new languages, including German, French, Japanese, Spanish, Italian, Dutch, Polish, Portuguese, Danish, Simplified Chinese and Chinese Traditional. Adjust the maximum conversion speed as 5X. 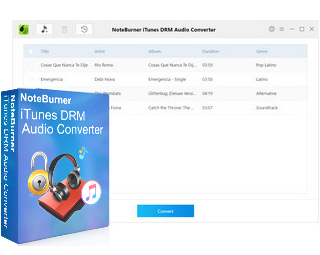 The new released version can convert both DRM-free music and DRM-ed music files like Apple Music files, audiobooks and M4P music to plain MP3, AAC.